Some years ago, we have introduced in the pedagogical scenario of a distance university course a learning activity consisting at having students create their own knowledge models with the knowledge modeling software MOT developed by Paquette (2002). At the same time, was initiated a series of studies1 aiming at evaluating the learning benefits and exploring the meditating effect of the use of this tool in the learning process, both in individual or collaborative conditions, as well as in face-to-face or distance educational settings. In our research, MOT is mainly used as a mean to support students’ text comprehension, but we also proposed this tool to professionals engaged in a vocational university program to help them reflect on how the curriculum knowledge domain is instantiated in their own professional practice. 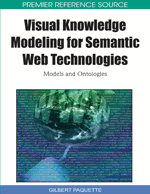 In addition, we provided training sessions to faculties and produced some documentation (available on the web) on the educational uses of knowledge model- ing software in higher education (Pudelko & Basque, 2005).